New remix contest by Beatport. This time you have the chance to remix two tracks (only one or both): “Bostich” and “Oh Yeah” by Yello. Check the big prizes out! Following the hugely successful Depeche Mode Remix contest, Beatport is proud to present the second edition in our remix contest series ‘The Legends of Electronic Music’. 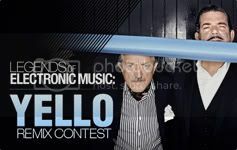 For the first time ever, Beatport is offering producers the chance to remix Yello. This contest is unique because for the first time in a Beatport remix contest, users are able to select from two available Yello songs and can create a remix of one or both tracks. On November 17th, 2009, Beatport will make available for download the stems of ‘Bostich’ the band’s break through classic and a favorite of many Yello fans, and ‘Oh Yeah’, the band’s biggest commercial hit to date. ‘Oh Yeah’ was featured in Hollywood movies like ‘Ferris Bueller’s Day Off’, ‘Beverly Hills Cop’, ‘The Secret Of My Success’ and several others. “The world of electronic music would not be what it is today without a few visionary pioneers like Yello. This band helped create a new sound, entirely based on synthesizers and samplers” stated Ronny Krieger, Beatport’s Chief Programming Officer. This is an amazing opportunity for all aspiring producers to join the likes of Carl Cox, The Orb, and Moby by putting their own spin on Yello’s classic electronic tracks. 1. November 17th – November 23rd: Download phase – The remix parts of Yello – Bostich Remix Contest and/or Yello – Oh Yeah Remix Contest. You may purchase the stems bundled at $4.99 USD each. 2. November 24th – December 7th: Upload/Submission phase – Upload your remix to Beatportal to www.beatportal.com/remix. During this phase the entries can be listened to, but not voted for. 3. December 8th – December 22nd 2009: Voting phase – The public votes for their favorite remixes by ‘spinning’ them. After a period of deliberation, the winner will be announced on or around January 5th, 2010.
pay to have the ‘privilege’ to remix our track!?? wft? Hi Charles, thanks for commenting.